The trouble with boats is that when they are big enough to enjoy, they are too big to store at home. We know what its like - you can't park it in the driveway because that would block access to the garage. You can't park it in the street because what doesn't get stolen will be ticketed by the city parking police. You could park it at the local marina but that would probably require a second mortgage. We have the answer to your Brisbane indoor boat storage dilema. We provide easy access secure boat storage at an affordable price. 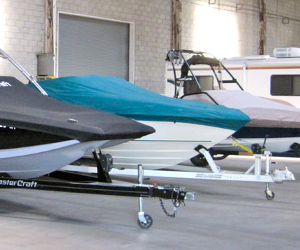 Your boat will be stored in a secure, fully enclosed indoor facility on your own trailer. We are located right near the M3 in Salisbury South Brisbane with easy access to the M3 and Gateway Motorways. 24/7 access is available via pincoded access (with prior notification). We have wide driveways to the Brisbane Boat storage facility for easy maneuvering. Being in Salisbury we are close to Brisbane city and motorways that provide easy access to the waterways of Moreton Bay, Gold Coast and Sunshine Coast.